Carrington & Co. purple guilloche enamel cufflinks. Among the rarities in the world of antique cufflinks are gold cufflinks decorated with guilloche enamel. In part the rarity stems from the expertise and time needed to craft these glittering masterpieces. As a result, relatively few were created. Also, over the years the broad enamel surfaces were susceptible to wear and scratches. So, even fewer pairs have survived. The purple and white enamel cufflinks pictured above are a fine example of guilloche enameling. They were crafted by Carrington & Company in 14kt gold around 1920. Guilloche enamel brings together two ancient and exacting arts - enameling and engine turning. Enameling is the art of fusing powdered glass on metal to create a hard, vitreous surface. The glass can be clear or colored, transparent or opaque. Examples of enameled jewels have been found among the ruins of the ancient Mycenaean civilization on Cyprus. The ornaments (sorry, no cufflinks) date from the 13th century BC. Link & Angell dramatically engine-turned cufflinks. Engine turning (or guilloche) is the art of engraving intricate, repeating patterns on a metal or ivory surface. The common guilloche designs include radiating stars, wavy lines, intricate spirals and concentric circles, ovals and other figures. The Link & Angell cufflinks pictured above are a nice example of the engine turners art. These cufflinks are named "Winter Rose" because of the beautiful radiating petal-like pattern and frostiness of the white gold. They were crafted in 14kt gold around 1920. When an engine turned surface is covered with a layer of transparent colored enamel (i.e., guilloche enameling) magic occurs. The colored enamel pools in the valleys of the engraved lines adding rich color where the engraving is deepest. Subtle gradations in the intensity of the color highlights the design and throws the pattern into almost three dimensional relief. The effect is mesmerizing. 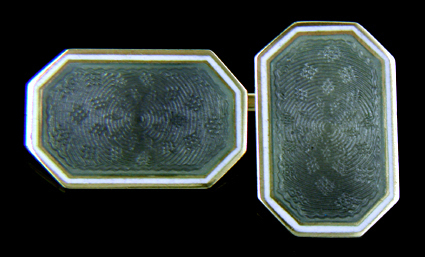 Carrington blue-gray guilloche enamel cufflinks, circa 1910. The enthusiasm for guilloche enameling during the late 19th and early 20th century was sparked by the creations of the master Russian jeweler Peter Carl Faberge. Faberge and his workmasters created a dazzling array of enameled jewels and objets d'art. In doing so they elevated the arts of engine turning and enameling to new heights. Among Faberge's many enameled creations were cufflinks, desk accessories and the famous Faberge Easter Eggs. The above Carrington cufflinks may have been inspired by Faberge's work. The subdued blue-gray enamel and classic canted-corner shape of the cufflinks recalls the elegant jewels of the Russian master. They illustrate the simple, elegant designs favored by Carrington & Co. and the firm's uncompromising commitment to craftsmanship. Crafted in 14kt gold, circa 1910. William Huger blue guilloche enamel and gold cufflinks. Equal to Carrington & Co. in creating beautiful guilloche enamel cufflinks was William Huger & Company. Of the two firms Carrington was the more prolific. But what Huger lacked in numbers the firm made up for with the beauty of its cufflinks. The above Huger cufflinks feature light blue enamel over an intricately engine-turned pattern. The guilloche design brings to mind the fanned tail of a peacock. When wedded with the blue enamel the effect is like exploding blue fire works in a clear evening sky. The enamel centers are framed with gold borders of foliate and geometric scrolls. Crafted in 14kt gold, circa 1920.